It's that time of month again, cake time! This is my 6th installment in my Cake Slice Bakers tenure and I think this one might be my favorite so far. It's hard to say that as a definitive because they have all had their merit and a couple have been REALLY DARN GOOD! Like the cinnamon buns. The gooey, ooey, soft and scrumptious potato dough cinnamon buns. Oh, the cinnamon buns. Those were good too. But this cake is something entirely different altogether and was an impressive dessert for a more adult pallet. For those of you who need a little refresher on what we do in The Cake Slice Bakers, I'll give you the quick run down. Each November we start a new cake cookbook. Each month Laura from Baking in Pyjamas picks 4 recipes from the book. We each pick one to bake and keep it a secret from the rest of the group (even if they are begging you to tell them early!) On the 20th of the month we each post the cake we made and link to each other's cakes. It is always fun to see what everyone decided to bake and what they thought of it. This year we are working our way through Maida Heatter's Cakes. Our choices for February were all so tempting to make. I mean the Kansas City Chocolate Dream cake sounded dreadfully delicious. I sure hope somebody made it so I can see it. Pineapple upside down cake is always so good and I can't even tell you the last time I had one, so that was certainly tempting. I have been trying to use this group to push my baking boundaries though and I had never made a sponge cake before. So, sponge cake it was. We were invited to dinner at my mother-in-law's house, so I knew this would be the perfect time to bake it. The sponge cake was actually a lot easier to make than I had imagined. Normally separating the eggs, whipping and folding would have been enough for me to move on to the next recipe. But I guess the great plan to broaden my horizons has been paying off. I did it and it was fun! Sure, it took a couple more dirty bowls than normal. But, I got to use both my hand mixer and stand mixer, and I figure if I have them I might as well use them. Win, win! 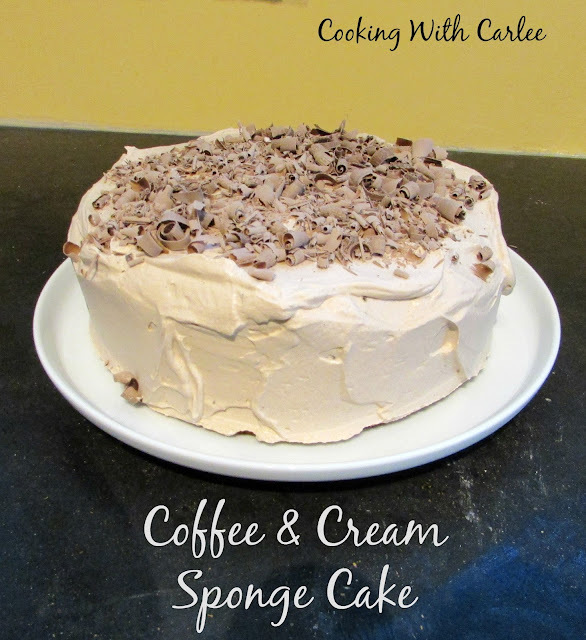 The cake had a nice coffee flavor and the spongy texture that gives it the name. The icing was a light and airy delicious pile of slightly sweet, slightly coffee, slightly chocolate whipped cream. YUM! The whole thing worked so well together. I shaved some chocolate to sprinkle on top and it was met with rave reviews. I will definitely be making this again! Place a rack in the middle of the oven and preheat to 350 F. Prepare 2 9-inch pans. I sprayed mine with baking spray (the kind with the flour in it), but you can do whatever works best for you. Dissolve coffee granules in the hot water and set aside. In you mixer bowl, beat the egg yolks, 3/4 cup of sugar until pale and thick. Turn mixer to low and stir in a couple of tablespoons of the flour mixture. Add the vanilla and coffee mixture, beating until smooth. Be sure to scrape the sides of the bowl with a spatula, then add the remaining dry ingredients and mix until just incorporated. In a separate clean bowl, beat the egg whites and salt until foamy. Slowly add the sugar and continue to beat until they form soft peaks. Spoon a small amount of the egg whites into the yolk mixture and fold in to lighten it. Fold in the rest of the egg whites until blended, but not any more than you have to. Bake 20-25 minutes, until the top springs back when lightly touched. Cool for 2 minutes, then turn out. Continue to cool, right side up on a wire rack until completely cooled. To make the icing: Place your mixer bowl and beater in the refrigerator. Chop the chocolate and melt in the microwave. Start with a thirty second burst, then go in fifteen second increments stirring between each one until the chocolate is smooth. Stir the coffee granules into the water until dissolved. Pour over chocolate and stir until smooth. Set aside to cool. Once the chocolate mixture is completely cool, add a couple of tablespoons of the cream to it and stir until smooth. In the chilled bowl, whip the remaining cream, vanilla and sugar until soft peaks form. While the beater is running, add the chocolate mixture and beat until the cream is stiff enough to work as an icing. Layer the cake and frosting, smoothing the whipped cream as you go. It is soft and billowy, so you can make it look nice as is, but we really liked the chocolate shavings on top! That looks and sounds delicious Carlee. One on my list to definitely try. You should, it was so good! I'm so proud of you for trying these new skills in the kitchen. I'm sorry you inherited the tendency to avoid recipes with too many steps from me. You have a inspired me to get past that. It really is fun once you get over all of the dirty dishes. Plus it was fun to have the stand mixer and hand mixer going for the same cake batter! This is one beautiful cake! This reminds me of the famous Goldie locks mocha roll! Nicely done it looks delicious! I'm not sure I've head of that one, but now I am off to look it up! Thanks! This looks awesome. Love your video! Hope you share this tomorrow at What'd You Do This Weekend? I Pinned, G+, and Yummed! I should be able to find it for the next cake occasion! Thank you, Lita! It was such a good cake and a great one for the people who don't like their desserts super sweet. Unfortunately I am not one of those people, but I loved the cake just the same. I will be stopping by tomorrow for sure! I don't blame you, normally I would have skipped over it but I am so glad I went for it! I love when our group ends up making different cakes. I love getting to see them all because I have no imagination and there are no pictures in the book! Though I do love seeing the little differences between the cakes when people bake the same ones too. Looks delicious! I love the Cake Slice Bakers program you're in! It is so much fun! I love that the choices are narrowed down to each month and I am trying things I may not have otherwise! You are certainly welcome if you ever want to give it a go! Thank you, it was sooooo good! This sounds like heaven! I definitely need this on my table. Thank you for sharing at #overthemoon. Pinned and tweeted. Thank you! I can't wait to make it again! I drooled a lil' bit the first time I saw the title of this post and more when I saw your photo. It looks soooo good! Thank you! I am so glad I went for it, the results were definitely worth it! I am glad you made this and yes, it is indeed fabulous looking and great addition to the dinner at your mother-in-law's! Oh, Carlee, yum! This looks both sinful and light - is that possible!! I love the flavors, too. It is! Isn't that crazy?! I need to make another ASAP! Carlee, however did you end up with so much cream? I had barely any lol. I enjoyed this one too, a lovely light dessert. It just whipped up great! I dumped the pint of cream in and let the magic happen. I think I could have eaten the whole lot of cream right out of the bowl if I hadn't already promised to bring dessert that night! Your cake looks so professional with the shaved chocolate topping and your sponge just lovely in height and texture, too. I bet everyone at the dinner party was wowed! We were all raving over it, that is for sure! It was a lot of fun to make and even more fun to serve. This looks divine! Thanks for sharing on our Tuesday Tips and Tricks Party! Thank you! It was a definite hit! It is hard to beat coffee and cream in cake form ;-) I will head on over, what a fun idea! Oh my, life does not get better!!! It really is amazing, thanks! This looks so good Carlee! I showed my hub and we are both drooling over it. I promised him I'd make it this weekend so I'll let you know how it turns out. Thanks so much for sharing at Inspiration Thursday! Yay! I can't wait to hear how you like it! I hope you enjoy it as much as we did. Boy does this cake look and sound so delicious Carlee! Thanks for the recipe and sharing it with us at Cooking and Crafting with J & J. It really is! Thanks so much for hosting! I love a good coffee flavored cake. Thanks for sharing on the Creative K. Kids Tasty Tuesdays Linky Party. I hope you will join us again next week. This one is a keeper, that is for sure! Thanks! this looks so delicious! thanks so much for sharing at Merry Monday! Thank you, it was really good! I totally pinned this! Sounds amazing!! Thanks Jess, you should definitely give it a try! Oh that looks so delicious. Especially the icing! I don't like drinking coffee but I love coffee flavoured cake, but it is not something I have very often. It is soooo good. But I live on coffee, I'm not sure how a morning would go without it! 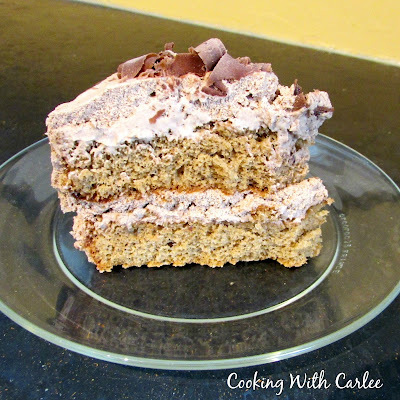 We featured this cake recipe at our Monday Cooking and Crafting with J & J! Thanks and we hope to see you again! Girl, I've been in a comfort food mood and for me coffee and chocolate are a hands down mood lifter. This cake looks and sounds absolutely delicious. I've only ever made a sponge cake once and it was light and fluffy I loved it. Now I'm really really hungry, or should I say hangry for some coffee and chocolate. Pinned this one was definitely a winner! Thank you so much! I had never made a cake quite like this one and it was definitely worth it! I can't wait to make another one, I am sure my grandma will LOOOOOVE it too so I need to make one for her! Thanks so much for linking up at You Link It, We Make it this week! I didn't get a chance to make it (yet, but oh I will), but I am featuring you as one of my additional features! Shoot me an email at uncookiecutter@gmail.com and let me know the email you use for Pinterest and I'll invite you to our group party board. Hope to see you back in the morning to party :). I hope you love it when you do! I'll email you shortly, thanks! Gorgeous cake, Carlee! Thanks so much for linking up at the You Link It, We Make it party and we hope to see you again! Your recipe is featured on Full Plate Thursday this week. Hope you have a great day and enjoy your new Red Plate! Thank you so much, Miz Helen! Pinned. This is on my to-do list. I have made coffee-flavor desserts before and they are always a hit. Now another way to present a great flavor. Thank you! I love coffee, but don't make many desserts where coffee is the star. I need to expand my repertoire! Thank you! It is in my short list to make this Mother's Day. I know my grandma would love it!